In an attempt to revolt against the complexity of the such styles as the bouffant hairdo, Northeastern girls began ironing their hair in an attempt to make it as straight and natural as possible. In order to get this look, young girls would simply lie their head on an ironing board while a trusted friend would iron the hair in one inch sections, the process taking up to an hour. 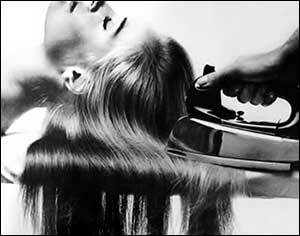 The girls had to be careful, however, not to iron the hair for too long of a period of time as that could leave burn marks in the hair or could make the hair too dry or brittle. The fad diminished in the early seventies as other styles became the vogue.